Its been a while since I've played a show. I spent the last six months ensconced somewhat uncomfortably numb in the bleak mid-winter. It was hugely depressing. Hurtling toward 30 at the speed of light and with little or no sunshine on the horizon. I must be a real sucker for seasonal affective disorder. But then the magic clock ticked at 5:35pm on March 13th and I was risen. Or thirty at least. And that particular melodrama was over. What next? I took some advice from a well meaning friend late last year after we had organised a rather successful art exhibition. "Go out and make some money, then you'll have all the time in the world for music". I questioned this a little at the time but I took there advice and spent a time pretending that I was Gordon Gekko. This did in fact make me slightly richer. It also made me quite ruthless, depressed and very fat. More recently I took the advice of my ex-girlfriend, who quite amazingly still seems to think that there is some value in my BoHo musical mojo. She said I should play some gigs. I agreed and decided to organise one. My whole mindset changed overnight and it felt very good. Now there are a couple of shows that I have on the books that I am promoting and playing at. 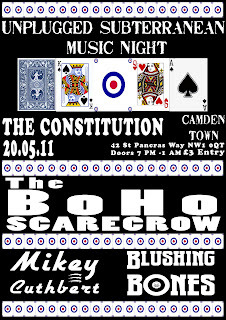 In August, Who's Next are performing Quadrophenia in Kilburn and The BoHo Scarecrow is supporting and in May, the Unplugged Subterranean Music Night will rock the Constitution Cellar Bar in Camden out. Its a great line-up. My pal Mikey Cuthbert, he of In The Attic fame (which seems like a lifetime ago now but you can see a bit of it here) will be trekking up from Southend to take a bow. Mikey is an immensely likeable guy with some great stories to tell. He fits right in with the venue and the whole unplugged theme. Plus, I haven't had a pint with him for a while. We also have Blushing Bones, who Josh Townshend is playing with for this show. I met Josh last year when he was playing with Thunderclap Newman and I was organising The Who Convention at which he played. He's another nice bloke, who has been doing lots of exciting things recently including opening a new studio (http://www.bostonhousestudio.co.uk) and supporting the revitalised Big Country at the Shepherds Bush Empire . Then there's this BoHo Scarecrow character. Not quite sure what to put in the set. There's part of me that wants to do this new Light Gate opera that I've been working on, or dust off Attack Of The Chevron Action Flasher mini opera for the night...or maybe just play a bunch of songs that seem to work. What I do know is that quitting smoking has filled me full of energy and I've been out training and its been a revelation. It will be a great night. Brilliant venue down a back street in Camden Town on the canal. The Cellar Bar where the show will be opens onto the tow path and we'll be doing full classic album playbacks. You can tweet me suggestions for which ones you want to hear to @bohoscarecrow. 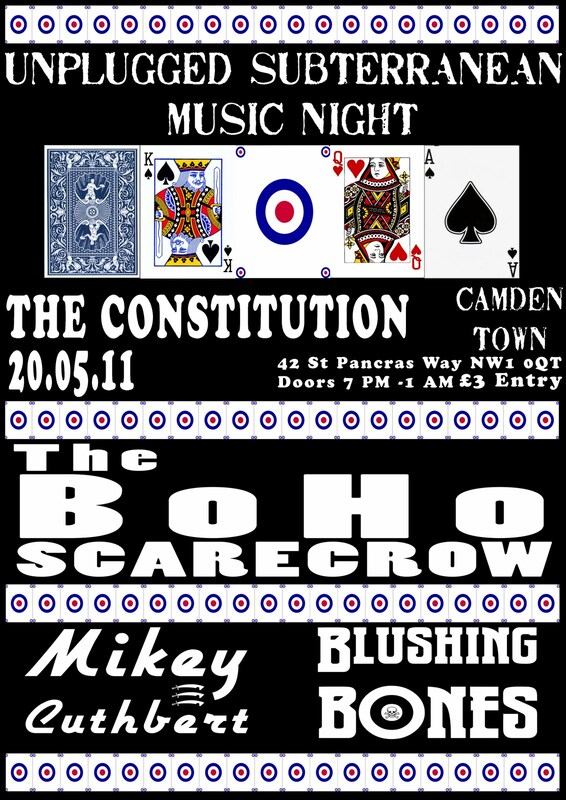 Hope to see you there on May 20th at the Constitution Pub in Camden. Doors open at 7pm and entry is £3. We will be partying past midnight with the albums getting more classic as the night goes on!